Deeply distressed by his wife’s adultery, Akitada returns to the capital to patch up his marriage and to help Superintendent Kobe with a case of poisoning. But before he can deal with either, the prime minister orders Akitada to save his dying brother who is plagued by a vengeful spirit from his past. Unable to refuse, Akitada plays a risky game to bring justice to some of the dying man’s victims. Soon he is in even more deadly trouble when he tumbles into an affair with a dangerous woman and becomes the target of a cold-blooded assassin. The mysteries in I.J. Parker’s Sugawara Akitada saga, set in the latter part of Japan’s Heian Period (794-1185), are now up to 17 full-length books. Throughout, she has skillfully adopted the literary model of the traditional Asian crime novel in which the protagonist, a “righteous official,” must investigate several puzzling cases. A retired professor of literature, Parker was originally drawn to the period via research. The work under review involves struggles with a vengeful spirit (ikiryo) that seems to have invaded the body of a nasty high-ranking noble named Fujiwara Tadanobu. The rational Akitada rejects that premise as superstition; but then what’s really causing Tadanobu’s agony? In the second baffling case, a lovely young courtesan is accused of murdering her patron by bringing poisoned food to his jail cell. Together, the two cases underscore the importance of dispensing blind justice to both the high and low of society. Akitada must also contend with other problems. During his prolonged absence from Kyoto, his young wife Yukiko gave birth to a daughter fathered by another man. To avoid scandal, he is reluctantly obliged to claim the child as his own. As in Parker’s previous works, Akitada is supported by his crew of loyal retainers, who pool their investigative and martial skills to help their boss prevail. Akitada might be a poetry-writing, flower-sniffing, flute-tooting Heian aristocrat, but when duty calls he can be resolute, brave and incorruptible. I have little to add to what I've said before. Taken as a whole, the Sugawara Akitada series is one of the finest achievements in historical mystery writing. 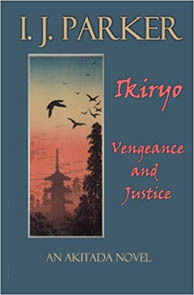 Her brilliant imagining of a very strange yet somehow familiar medieval Japan is flawless, at least to my Western eyes, and this volume is no exception, adding more to the rich tapestry of characters and events that make up a thrilling, evocative saga that draws you into a wonderful old world. I have been a huge fan from the first book, and have read every one since -- IJ Parker is one of the very best! The e-book is also available for: iBooks, Barnes & Noble, Kobo, Inkterra, Playster, Scribd, Tolino, 24 Symbols, and OverDrive.